Senate Confirms Jerome Powell As New Federal Reserve Chair : The Two-Way Powell, an uncontroversial pick of President Trump, is widely expected to follow the gradual interest rate increase policy of outgoing chief Janet Yellen. Jerome Powell, President Trump's pick for chairman of the Federal Reserve, testifying before a Senate committee in November 2017. He was confirmed by the full Senate on Tuesday. 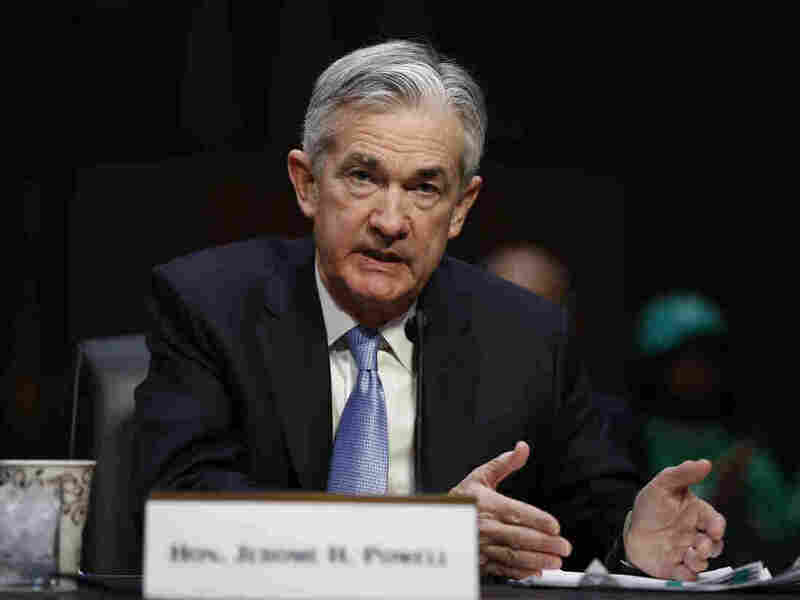 The Senate approved President Trump's nominee, current Federal Reserve Board Governor Jerome Powell, as the new head of the nation's central bank on Tuesday. The confirmation came in a vote of 84-13, an unsurprising action given Powell's support among Republicans and Democrats alike who expect that he will follow the policies of the outgoing Chair Janet Yellen. Yellen was the first woman to head the Fed. Trump had the option of appointing her to a second term, but instead chose the 64-year-old, Princeton-trained former investment banker who was originally appointed to the Fed board 5 ½ years ago by then-President Barack Obama. As NPR's John Ydstie reported last November when Trump tapped Powell, it was "the first time in decades that a president hasn't reappointed a chief of the central bank for a second term." "As a Fed governor, Powell has supported the policies of the Yellen Fed, which has only gradually raised official interest rates after leaving them near zero for seven years after the financial crisis. "'If the economy performs about as expected, I would view it as appropriate to continue to gradually raise rates,' Powell said in a speech before the Economic Club of New York earlier this year. Most analysts expect him to move rates higher at about the same pace as Yellen. "On the bank regulatory front, Powell has been supportive of the Dodd-Frank reforms, though in recent remarks he has suggested there may be room for some streamlining. 'Powell favors less regulatory burdens on banks' than Yellen, economist Mickey Levy of Berenberg Capital Markets says." As the Associated Press reports, Powell, a Republican, is viewed in Congress as a centrist. He was a partner at the Washington-based private equity firm The Carlyle Group and he will be the first Fed chair in 40 years without an advanced degree in economics. "The 13 senators who voted against Powell's nomination included four Republicans, eight Democrats and Sen. Bernie Sanders, an independent who votes with the Democrats. The vote total was initially announced as 85-12. But Sen. Dianne Feinstein, D-California, received permission to change her vote to no after the initial count had been announced. "But Sen. Sherrod Brown, the top Democrat on the Senate Banking Committee, praised Powell's tenure on the Fed board. "'His track record over the past six years shows he is a thoughtful policymaker,' Brown said." Powell was an undersecretary of the Treasury under former President George H.W. Bush.